Even with a new MOBA in the works, S2 says that HoN's here to stay. S2 Games just announced Strife, a shiny new MOBA that's like its previous one, only more refined and without all the mistakes. During the announcement, each new feature was backed up with some sort of learning experience S2 gained from Heroes of Newerth. Now, like a parent telling a child they have a new sibling on the way, S2 says that Strife won't diminish HoN's worth, and that it's here to stay. "HoN has a place," S2 chief executive officer Marc DeForest said. "We will continue to operate HoN for what we expect to be years to come. We're still on a growth pattern. We're going to be launching in China in December of this year. It's important to know that while we expect these two games to compete, that game is not going anywhere." 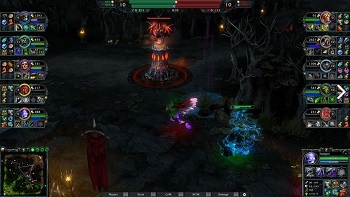 Heroes of Newerth launched back in 2010 and made the inevitable F2P metamorphose a year later. Said F2P model became even more free-to-play a year after that, when all the heroes became actually free, with only cosmetic items (and John St. John voice packs) up for purchase. S2 still boasts about HoN's 2.5 million active players.